Undertow. Jewels porcelain with high-quality, engraved and patinated bronze mounting. Ovoider, partially carcassed body on raised Qudrat foot with decorative plastic garlands, curly rising lid. On the shadows, in a dark green background, rich floral ornamental gold frame. In highlyovalen Reserves colored representations of a royal family, on the back large-area romantic landscape. Rich etched gold decoration. Passively sculpted square base, handles on both sides and lid crown. Verschiedene Edelholzfurniere auf massiver Fichte. Paar monumentale norditalienische Lacca-Povera und polychrom bemalte Terrakotta-balusterförmige Vasen, Ende des 18. Jahrhunderts. 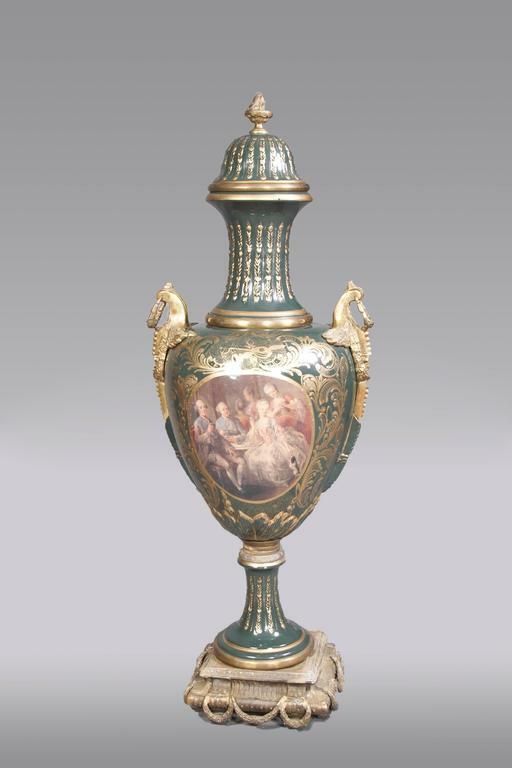 A superb quality French 19th century Sèvres vase with hand painted panel and ormolu mounts. 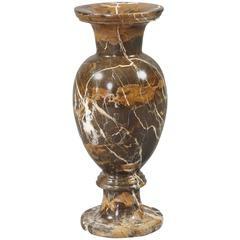 Measures: Height 39cm, width 12cm. Late 18th century blue and white Dutch delft vase is painted with a traditional design in cobalt blue. Chinesische blaue und weiße Vase aus dem 18. Jahrhundert 8 "Durchmesser X 18,25" hoch.